City A.M. is London’s first free daily business newspaper. Both cover news on the markets, global and local business news as well as contemporary lifestyle. You could’ve fooled me, but line dancing is now being touted as the latest Square Mile fad. Dancing company Corporate Dance, which organises “team-building” dance events for companies, says line dancing’s one of its most popular choices — along with salsa and ballroom, of course. The firm, whose clients include two of the UK’s biggest banks, is launching a new corporate event in the style of the Beeb’s Strictly Come Dancing show, designed to get guests ballroom dancing in couples after a short masterclass. There’s only one glitch — the City’s heavily male-dominated workforce. “The problem comes when there are more men than women amongst the dancers,” the group’s joint partner Adam Gardner points out. “Ladies don’t mind dancing with ladies, but as you can imagine, the men don’t enjoy cosying up to each other.” Better stick to line dancing then, cowboys. If conventional training methods are failing to inspire your employees, perhaps it's time to try something different. Virginia Matthews highlights some quirky ways to boost staff confidence. 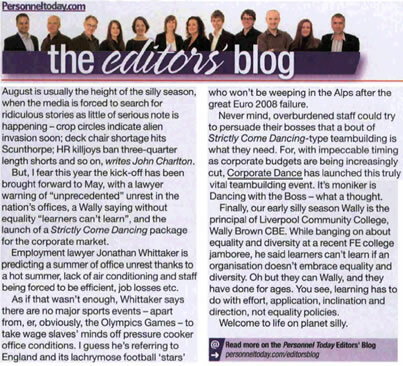 The article talks about a dance workshop that Corporate Dance ran for John Lewis Direct. It was a salsa class for 25 employees. If you have any further questions or now wish to book your lessons, please do not hesitate to contact us.